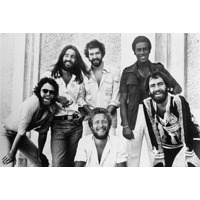 Average White Band (also AWB) is a Scottish funk and R&B band, who had a series of soul and disco hits between 1974 and 1980. They are best known for their million selling song, "Pick Up the Pieces". The band name was initially proposed by Bonnie Bramlett. They have influenced others such as the Brand New Heavies, and been sampled by various musicians including the Beastie Boys, TLC, The Beatnuts, Too Short, Ice Cube, Nas and Arrested Development. As of 2010, and almost forty years after their formation, they continue to perform.